Periodic maintenance of your generator is essential to ensure that any potential issues, which may occur due to general wear and tear, are avoided and it continues to perform to its specification. 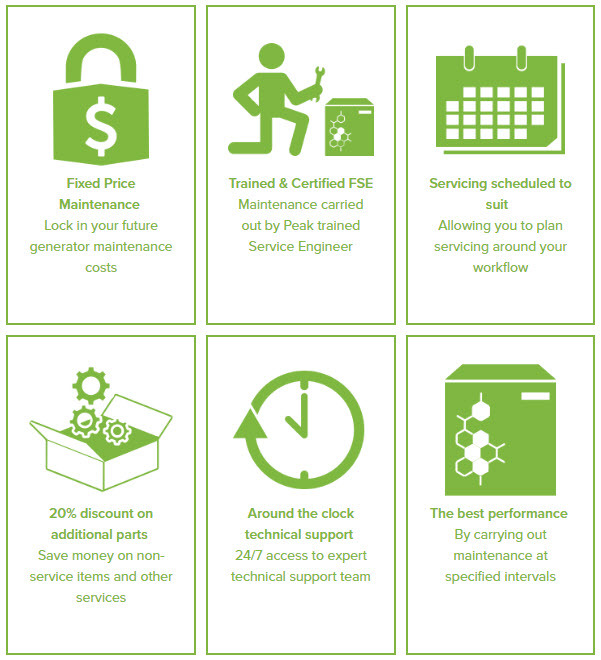 To keep your generator operating at its best, Peak Scientific has created a Fixed Price Preventative Maintenance (FPPM) plan, which will help you to better manage your generator’s maintenance costs and minimize inconvenience. From the moment your warranty ends, Peak will take care of your generator’s maintenance schedule and will dispatch a trained and certififed Peak Service Engineer to carry out maintenance when it is due. Our engineer will replace standard serviceable components and perform maintenance checks to keep your generator in good shape, protecting the integrity of your gas supply and allowing you to focus on your analysis. Fixed Price Preventative Maintenance ensures that once you buy a generator, it is looked after by a dedicated Peak engineer in order to prevent any unexpected break-downs and minimize the chance of downtime in your lab. With a fixed price for your preventative maintenance, you can lock in your costs for the long term by choosing a multi-year contract, guaranteeing the price of your service and protecting against inflation. Fixed price will cover all necessary PM servicing and checks, including the refit and replacement of the compressor when it is due. You will also benefit from a 20% discount on any additional parts, should you require them outside your planned preventative maintenance. Without regular maintenance, your lab runs the risk of unexpected downtime and the potential of unknown additional costs depleting your lab’s budget. With a fully managed schedule and a dedicated Peak Service Engineer carrying out preventative maintenance of your generator, your instrument gas will be one less thing to worry about in your lab. Sign up for Fixed Price Preventative Maintenance. Peak will contact you when maintenance for your generator is due and arrange the time to carry out the service which is most suitable for you. Peak will send the preventative maintenance service kit to your lab prior to the Field Service Engineer’s visit. Your dedicated Field Service Engineer will arrive at your lab on the agreed day to carry out your generator’s maintenance. In the unlikely event you encounter a problem out-with your generator’s scheduled maintenance, do not worry as you have access to round-the-clock technical support. Our technical support team will be on hand to assist you with any issues you may have and can arrange an on-site visit by a dedicated Field Service Engineer if required.